04/18/2018 6:00 AM by Jacob C.
In an effort to continue our coverage on the upcoming East End Grocery Store, we now have a conversation over its potential name. Have you ever wondered what makes Church Hill special? What makes people want to live here? There is no question that this neighborhood has a little bit of magic. Opening a business in this area and wanting to make sure you maintain all the things that make this place special can be a daunting task. 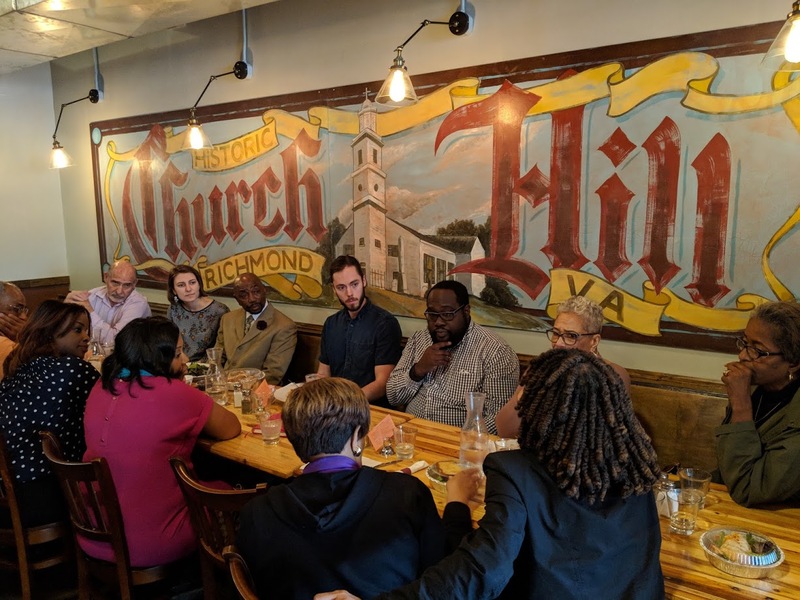 In an effort to further understand that neighborhood and work towards branding the new development on 25th and Nine Mile Road, the East End Grocery store (as it’s temporarily called), has been meeting with community leaders, local business owners, and local pastors. They’re being assisted by the VCU Branding Center to establish a name and branding for the store. They want to ensure that the name and the character of the store embody Church Hill. To accomplish this daunting task, the store’s leadership have set out on a journey to discover what makes Church Hill the place it is. I was fortunate enough to be invited to one of the gatherings that took place at Liberty Public House on 25th St. We had a wonderful group of attendees such as Ms. Mary Thompson, Lt. Keron Tull from the RFD, Todd Waldo, Torey Edmonds, Nadine Marsh-Carter and many others. Many of the people present had lived in the East End their entire lives and were happy to contribute to the conversation. The first question that started our talk was: “What are one or two of your most defining moments in Church Hill?”. People spoke of resilience; how long-time residents and community leaders have worked together for the past 20 to 30 years to reawaken this neighborhood. The moments that, for them and their family and peers, emphasized the community’s rich history including some of its most impressive leaders. In addition, we also discussed the disparity between residents living and working in the East End. Residents that live in poverty and the residents that prosper and the divide that exists. Sometimes multiple divides. One attendee, representing the Peter Paul Development Center, referred to the divide as The Tale of Two Cities. Everyone was in agreement that new developments, including the new store, need to bridge the gap between The Two Cities, as the neighborhood was referred to, and that the discussions and community feedback the grocery store have been facilitating are exactly what is needed. While a name wasn’t chosen yet, and I do not envy Norm Gold the task, it’s clear that the still unnamed East End Grocery Store will work hard to honor the history of this place and create a space that is inclusive for all Church Hill Residents. Creating what will hopefully be another block in the bridge to bring our community closer together. Who is Mary Marsh and Senator Henry March? Torey, a late night typo by our fellow editor. Thanks for the edit and we’ve made the proper changes: Miss Mary Thompson and Senator Henry Marsh (who was actually at one of the other meetings). If they were to name it based on what was the defining moment of my time in Church Hill, they would call the store “Home Burglary Foods” because that will bring in shoppers near and far.